A payment gateway binds together all the stakeholders involved in a transaction with a buyer, merchant, buyer’s bank and seller’s bank. Which is why it takes a long time for an individual to become fully comfortable in implementing a gateway in a website. A payment gateway integration is crucial for highly successful online transactions. So, we explain here the API calls that usually happen when making a transaction with a payment gateway. The image above shows the main integration steps. To initiate a transaction, the merchant generates a POST REQUEST (which is a particular mode of interaction on the internet). The request must include mandatory and optional parameters. The mandatory fields include a key (provided by gateway), txn ID (order reference number generated at merchant’s end), amount product info, first name, email, phone, service_provider, and hash (checksum). Merchant also calculates a hash and sends it to the payment gateway. When the POST request reaches PayUMoney, the customer would be re-directed to payment gateway’s (PayUMoney’s) payment page. The customer now selects the particular payment option on payment gateway’s (PayUMoney’s) page (Credit Card/Debit Card/Net Banking etc) and clicks on ‘Make Payment’. Now, payment gateway re-directs the customer to the chosen bank. The customer goes through the necessary authorization/authentication process at bank’s login page, and the bank gives the success/failure response back to the payment gateway. When the transaction POST request hits the payment gateway server, a new transaction entry is created in the database. To identify each new transaction in the gateway database, a unique identifier is created every time at gateway’s end. Our payment gateway marks the transaction status on the basis of response received from Bank. A final transaction response is sent to the merchant through a POST RESPONSE. In this response, the merchant would receive the final status of the transaction. Merchant will also receive the hash parameter here. This is done to strictly avoid any tampering attempt by the user. Different kits provide different APIs to automate a lot of tasks. PayUmoney provides developers two kinds of kits for easy integration– shopping cart integration kits and platform based integration kits. 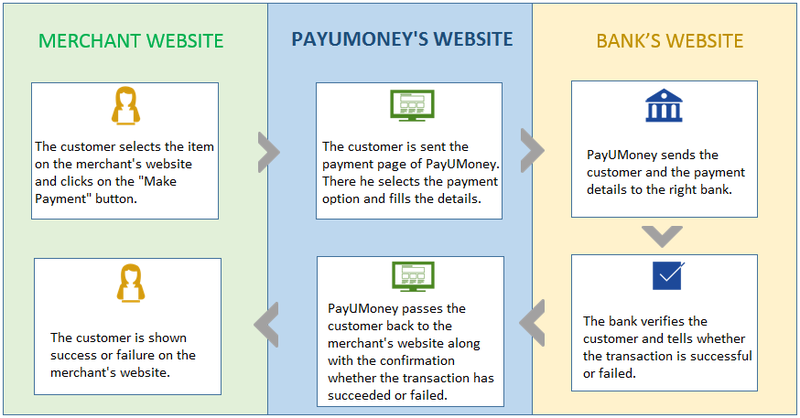 PayUmoney has the easiest and quick payment gateway integration process. Know more about the PayUmoney Payment Gateways Integration with your website now!